The vernier scale is one rechnological device that raises the sensitivity of one scale when its division is subdivided. On this simulator the scale is 1:100, that means that the graved numbers are tenth hundredth part of the meter or the centimeter – bigger marks, that were subdivided by ten – smaller marks, the millimeter. 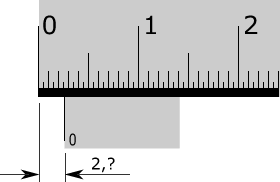 The vernier has ten spaces between the vertical spaces, so, the instrument divides by ten the millimeter, the smaller division of the main scale, obtaining the tenth of millimeter 0.1mm. In the metrology at metal mechanich section, this principle is used in many measurement instruments: caliper; micrometer and goniometer. 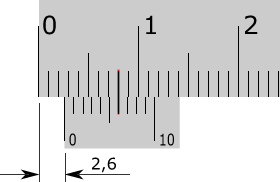 In the simulator in the end of the page, the vernier is the infeior scale, that slides under a main scale (scale 1:100 of meter – this means that the numbers of main scale express is centimeters, however, how this linear dimension is divided by nine strokes -ten spaces- the smallest division of the main scale is the millimeter). The mark of the vernier that aligns with the races of teh main scale will provide the tenth measure, that has to be summed the the integer measure of the main scale (number of interval between the marks and teh zero (0) of the vernier in the left side). Observe that when the zero of the vernier it is not perfectly aligned with some mark of the main scale we are not sure of its position (example. : 2 † 3 = 2.?) -in the given example, we can say that the value in the point ‘†’ is bigger than 2.0 and smaller than 3.0. We just can assume one approximation more accurate: 2,4? ; 2,5? ; 2,6?;2,7? -figure 1. 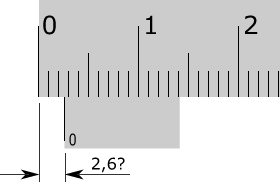 One possible solution would be dividing the spaces in the main scale, so that would have more marks, increasing the chace of the zero of the vernier align with some of them (example. : 2 ¡ ¡ ¡ ¡ ¡ † ¡ ¡ ¡ 3 = 2.6). However, this solution is restricted to human being vision limitations, among others -figur2 2. Technically, what the vernier does is to increase the sensitivity of the main scale, when subdivining your smaller division – figure 3. By definition resolution is teh smaller difference between indicators of one display device that can be significantly perceived . This way, the smaller measure offered by one instrument is called ‘resolution’. We can determin the resolution of the instrument dividing teh smaller division of the fixed scale by the number of divisions of teh vernier. 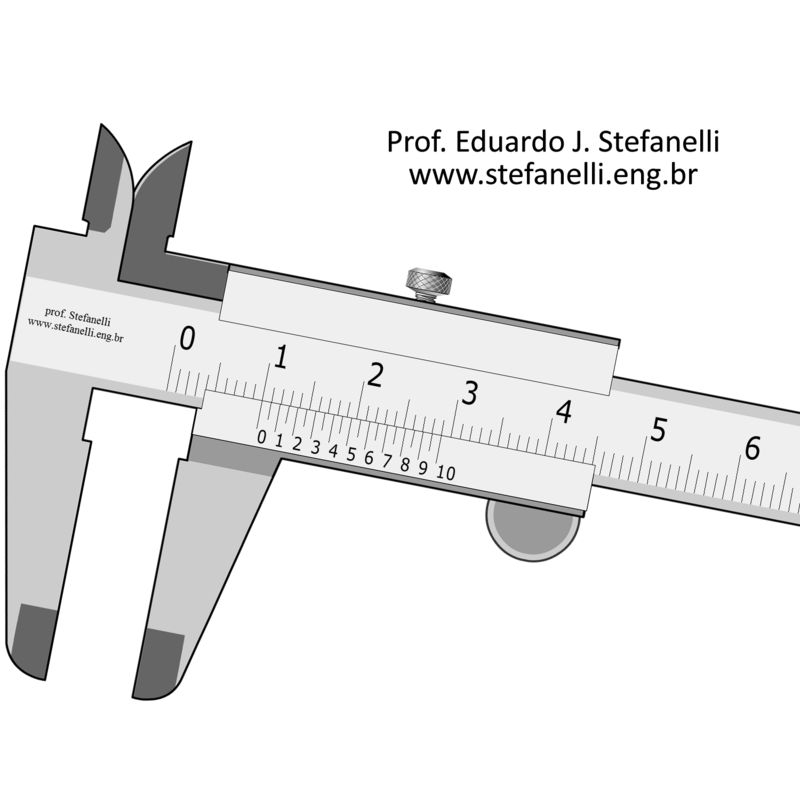 In this simulator the smallest division of the main scale (fixed scale) is one millimeter, which was divided by the ten divisions of the vernier.